Springtime Lunch at the home of Kerry and Marco Bardelli The Singapore Chapter’s 2010 edition of the Springtime Lunch event was hosted on March 11 by the Chapter’s Treasurer and his spouse, Marco and Kerry Bardelli, in their characteristic colonial black and white residence in Adam Park. Nearly 70 guests including businesspeople, entrepreneurs and local socialites attended the event and the event was graced by the presence of H.E. Italian Ambassador Anacleto Felicani and Mrs. Felicani, among other distinguished personalities, including Mr and Mrs Guibert, Mrs. Justine Wingrove, Mr. Alberto Martinelli, Mr. Angelo Corbetta, Mr. and Mrs. Sponzilli, Mr and Mrs Garcha, and Mrs. Carole de Senarclens. The Italian lunch was entirely sponsored by Oso Ristorante to the benefit of the Pistorio Foundation. Founder Pasquale Pistorio also was present and spoke passionately about his recent inauguration of the new primary school in Huay Kuk, Chiang Rai, Thailand built by the Foundation and that the Foundation currently supports the education, primary health care and nutrition of nearly 1200 children in Thailand and Cambodia. Through sales of tickets and live auction led by Torrey Dorsey from the Singapore Polo Club, the fundraiser enabled the Foundation to raise nearly SGD 28,000, 100% of which will go directly to support children’s education programs in Thailand and Cambodia. Many thanks to our generous donors and sponsors, able auctioneer, and volunteers of the Singapore Chapter that made this lunch a great success and will enable tens of children to attend school in the coming academic year. 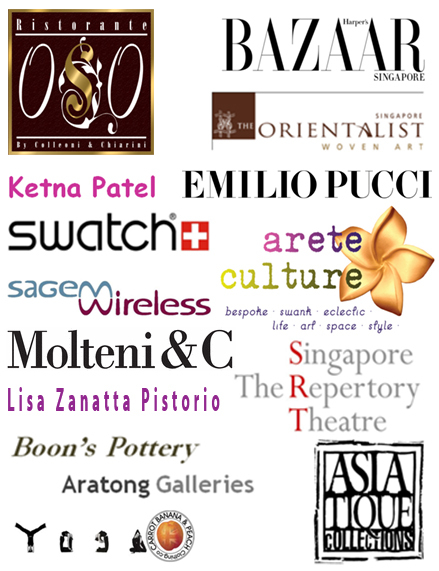 A special mention goes to our event partners, Oso Ristorante, who generously provided the lovely food & Prosecco; Mr and Mrs Bardelli for helping in the organization and offering a marvelous venue for the event and sponsoring the valet parking; to our event media partner, Harper’s BAZAAR Singapore; and to our sponsors of the 13 exciting auction prizes ranging from paintings, to home furniture, and jewellery: Lisa Zanatta, Ketna Patel, Emilio Pucci, Molteni & C, Asiatique Collections, Swatch, The Orientalist, Sagem Wireless, Singapore Repertory Theatre, Arete Culture, The Boon’s Pottery, Carrot Banana Peach.